Reproducible Master Copy. Suitable for use with older pre-school and early elementary children. Suggestions are included for administrating the class, distribution of responsibilities, coordinating and training volunteers, room arrangements, snacks, and games. Also available in a Kit with Sing-Along Songs for Young Children. …and to urge the preaching of the gospel to the whole world. 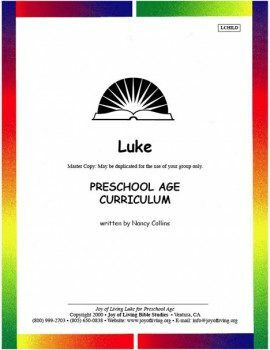 In Luke we learn about the importance of prayer, and about the role of the Holy Spirit in Jesus’ life and in our own lives. Luke also addresses the role of women, and has a special concern for the poor and for those deep in sin.